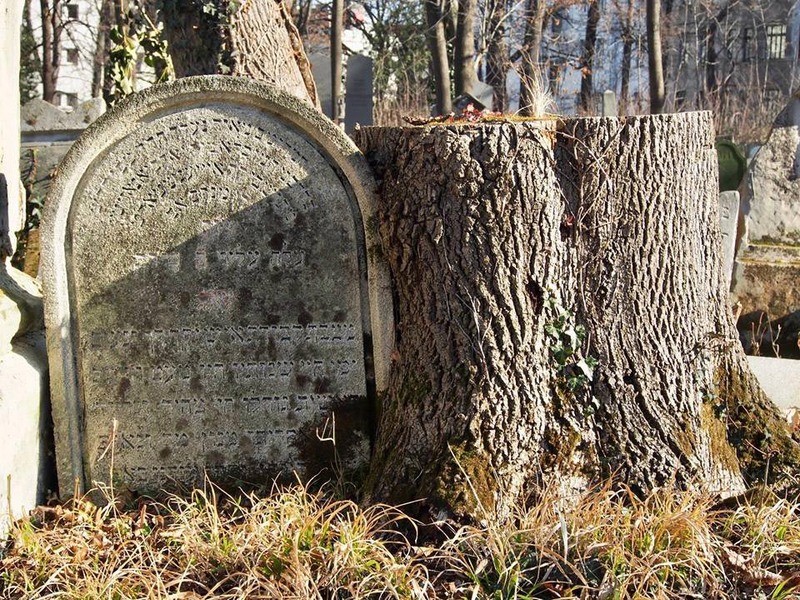 The association "Save the Jewish cemetery Währing" has set itself the goal of supporting the Jewish Community of Vienna with the necessary remedial measures. For that donations are collected, set up a small museum, organized volunteer work to reduce plant growth and organizes regular tours to raise public awareness of this so important place in Vienna. The Austrian Jewish Museum in Eisenstadt is happy to support the club, especially when in addition to the planned restructuring measures and a really serious and long overdue, thorough work-up of this famous cemetery, that of a unique document of the Viennese culture, art, economy and society in the period Biedermeier is going. In concrete terms means that we successively the Hebrew grave inscriptions (there are thousands of them), transcribe and translate also possible, but in any case the most important data is read out. Already in 2012 the way Traude Triebel has all the death books of the Jewish Community relating to the Jewish cemetery Währing (Vienna) worked up, see our blog article "New database with approximately 29,000 entries 1784-1879„. The Hebrew inscription is no longer readable in full, sometimes it is very difficult to read. The supplements were custom built due to the early 20th century and the archivist of the Jewish Community of Vienna, Dr. Pinkas Henry, ca. 1905 corrected and supplemented handwritten documents are made. Line 2: Psalm 47,10 Very noble. Line 8: Conversion of the letter of the year, instead Trco stands cutterTo associate the "out of life Torn Will". Line 11: Genesis 47,9 Few and evil were the days of my life "Little and bad the days of my life were." Line 13: The employed in the grave inscription word And enlightened would be translated first "and shiny", which of course does not make sense in context. Probably thinking about Genesis 12.3: And I will bless your knees and Mkllic Auer "I will bless those who bless you and curse those who curse you." thanks to Claudia Chaya Bathya Markovits Krempke for the hint! Line 14: job 8,12 Refine Abu not pluck "In Bloom is not cut." Line 15: Literally well, "the entirety of his concern and his pain was taken." Heinrich (Zvi Hirsch) Janowitz, Born March 18, 1838, small traders from Eisenstadt, 14 Av d. 626 = July 26, 1866, buried at the Jewish cemetery in Vienna Währing. Katharina Janovetz (sic! ), Born October 16, 1841 in Eisenstadt (mother: Hani, Occupation Father: retailer) go 25 July. 1861 Heinrich Austerlitz, Trader, Sohn des Wilhelm Austerlitz and the Theresia (Austerlitz); wh . : Eisenstadt 25. Henry was at the wedding 26 years old, Katharina 19 (according to parish registers;. Strictly speaking, 20) years old. Buried at younger Jewish cemetery in Eisenstadt. Adolf/ph Janovitz, Born 08 August 1839 (Mother: Anna, Occupation Father: wine merchant), merchant's apprentice died, at age 23 at Gedärmentzündung on 19 June 1862 in Budapest. Alexander Janovitz (and his twin brother William), we have a Geburtsmatrikeneintrag (see above). 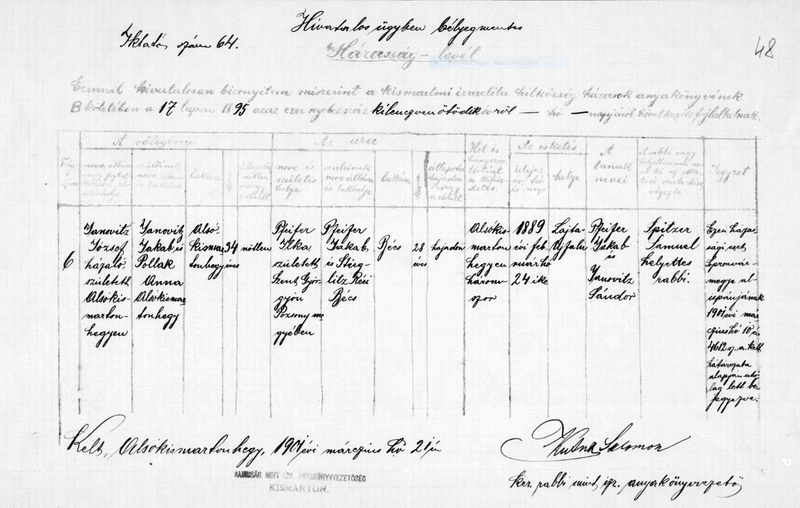 Siegmund Janowitz only one entry in the Sterbematriken (see below), at least with age indication exists that he was 1 year old that is, when he died. Due to the absence of the parents in the Sterbematriken and the lack of a birth entry Siegmund can only be assumed due to the specified mortality address (Eisenstadt 30) as a possible son of Jacob and Johanna Janowitz. However, when he died at 1 year (and we evaluate this information to be correct), he must have been born at the same time with the twins, Alexander and William. But neither triplets nor the birth of Siegmund found in the Geburtsmatriken. If one of the twins have changed his real name, both Alexander as Wilhelm also be considered to have been registered as Siegmund at death. But the riddle is my opinion that in all three cases (birth Alexander and Wilhelm and death Siegmund) in the register books given Hebrew name, so the Synagogalname. Wilhelm Wolf, Alexander Susskind and that is the surprise, Siegmund Susskind, So Siegmund seems to be most likely born when Alexander twin. Josef/ph (Avigdor) Janovitz, Born peddler 03 October 1854 (Mother: Anna Pollak), birthplace and home: Eisenstadt Judengasse 30; . 24 February 1889 go Ilka Pfeifer, Born: Szentgyörgy (St. Georgen) in Bratislava, wh . : Vienna, unmarried, daughter of Jakob Pfeifer and the Resi Stieglitz, Jacob was 28 years old at the wedding 34 years, Ilka. Rabbi was Salome Angle. 1. Before Emanuel Janowitz: go in Baden on April 11th. 1861 Cecilia Spitzkopf, Wh . : Leipnik 47, daughter of Leopold Spitzkopf and the Rosa (Spitzkopf), Emanuel was at the wedding 24 (actually 25) years, Cecilia 20 years old, both single. "Emanuel Janowitz, divorced from Cecilia Spitzkopf" and as a note: "Their marriage took place on 11. 4. 1861 in Baden". Somewhat surprising that the divorce record is not in the Sterbematriken and the Trauungsmatriken. 2. Before Emanuel Janowitz: go in Eisenstadt 06 April 1876th Hermina Kreutler, Born 29 in Kolin, wh . : Vienna, Glockengasse to their origin and family see Comment by Wolf-Erich Eckstein.